Performers include: Gordon Ramsay, Joe Bastianich, and Graham Elliot. Yet another Gordon Ramsay-hosted series, this TV show is a cooking competition but has a different tone than Hell’s Kitchen. 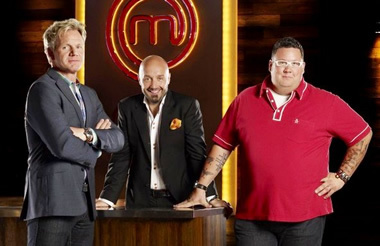 Ramsay, restaurateur and winemaker Joe Bastianich, and chef Graham Elliot (the youngest four-star chef in the US) serve as judges as home chefs compete against each other for the prize; $250,000 and having their own cookbook published. Out of the many who audition, a select 100 chefs are chosen to prepare their signature dish for the judges. After taste-testing the dishes, the judges vote yes or no on each individual’s work. The contestants need to receive at least two yes votes to continue on. Thirty chefs are chosen and, after this round, they begin to wear the MasterChef apron. These remaining chefs move on and compete in various challenges in which different numbers of contestants are eliminated. Challenges range from simple cooking tasks to the Invention Test in which chefs have thirty minutes to create a dish revolving around a particular theme. There are also team challenges in which chefs must work together to cater a party or run a restaurant. The chefs keep competing as the game progresses. Contestants are eliminated each time until one is finally crowned the winner. MasterChef The Professinals UK !!!! I would like to participate because I believe that my cooking skills are very well developed. Keep all Ramsey’s shows on TV!! !